Fish. It’s a slippery little thing – a different kettle of fish. Lots of people claim to detest it. My own father was one of them until he was in his late 20s and a particular restaurant experience changed his mind. My boyfriend was another fish-loather, having been brought up on the frozen cod fillets of land-locked Indiana; it was only when he moved to Louisiana and discovered crawfish boils that his taste buds were turned. I even remember Captain Birdseye boil-in-the-bag fish with parsley sauce from my own childhood – it’s a wonder I maintained the will to live. And yet nowadays, glorious fruits of the rivers and oceans are available all over the place – and especially in Holland, surrounded as it is by the fish-rich North Sea. Yes, the ubiquitous herring has always had its place in the Dutch collective heart, but until recently actual fish restaurants (as opposed to the haringhandel) were relatively hard to come by. Vis aan de Schelde was always a winner, and I remember going to Lucius once way back when I was a student… but other than that, when was the last time I went to a genuinely fish-specific restaurant? It was kind of by accident that I ended up at Viscafé de Gouden Hoek. My in-laws were staying in an apartment very close to Van Limburg Stirumplein, so we found ourselves hanging out at Piet de Gruyter and Pendergast even more than usual. It was while sitting outside the former that I noticed a new fish place across the square: almost utilitarian, with steel countertops inside and wooden benches outside. 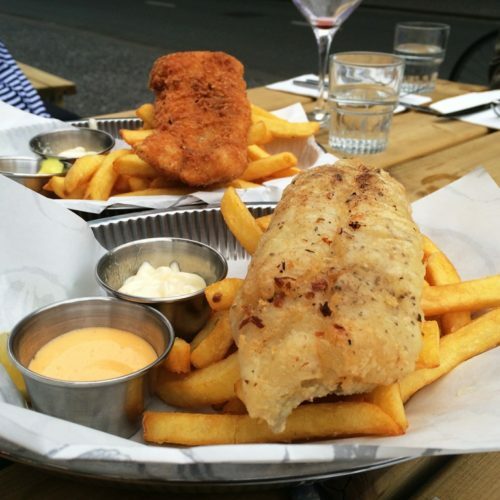 De Gouden Hoek’s main USP is fish & chips, which they serve three ways: in panko breadcrumbs with piccalilli mayo, in beer batter with remoulade sauce, and in tempura batter with a spicy mayo. The fish that’s cooked inside the batter or breadcrumbs depends on what’s been freshly caught – the day we visited we tried cod and halibut, both of which were super-fresh and pretty light despite their fried coatings. 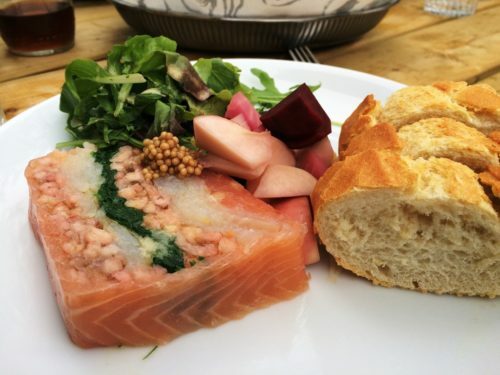 Wanting to try a few of de Gouden Hoek’s cold offerings as well, we ordered the seafood terrine: a beautifully layered slice of salmon, shrimps, halibut, spinach and mustard seeds, held together in a delicately briney gelatine. The fish of the day was a warm fillet of hake with roasted beetroot and a herby sauce that we were eager to mop up with crusty bread. The meal was so tasty (and decent value, too: €35 per person, including a glass or two of white wine) that my in-laws decided to return for dinner a few days later. Shortly afterwards, more American visitors were in town – this time an ex-colleague and her husband. Keen to continue my pescatarian theme, I booked us a table at the new branch of The Seafood Bar on the Spui. Here, the menu was much more extensive – but that only made it nigh-on impossible to choose. Eventually, we plumped for the “Fruits de Mer Seafood Bar” – a colourful sculpture of fishy delights arranged artistically over ice. The gamut ran from heavy hitters like lobster and oysters through to understated molluscs like winkles and clams. 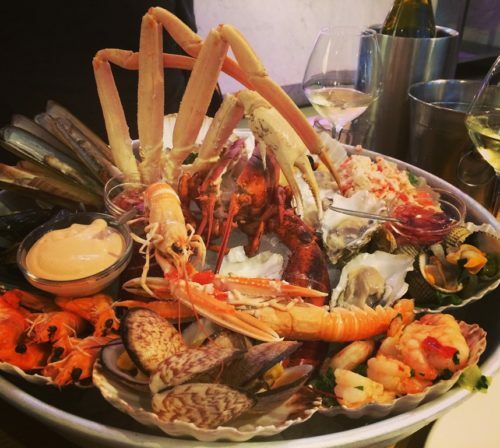 You can’t really go wrong with a huge platter of fruits de mer and a bottle of chilled Sancerre so long as the seafood is unfailingly fresh. The Seafood Bar’s version was fine, although it didn’t have quite that just-caught mouthfeel of plump sweetness. And at €62 per person (ok, we drank half a bottle of wine each), it wasn’t cheap either. Plus, my American guest felt that seafood requires more of an intimate setting, especially for the price; I’m not sure whether I agree, but the restaurant’s industrial chic is certainly a sign of our fuss-free, post-austerity times.